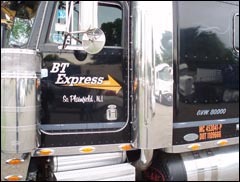 BT Express LLC is a New Jersey based professional trucking firm offering quality service with expectional rates for the nation’s trucking needs. We believe our success depends on the satisfaction of our cusotomers and with over 20 years of experience in the trucking industry we take pride in providing all of our current clients in the tri-state area. Future plans are to broaden the radius to include all 50 states of the union.